I got involved with community theatre in 2014 when I was commissioned to be Musical Director (and performer) for SeaSang’s involvement in the ‘Follow the Herring’ project. 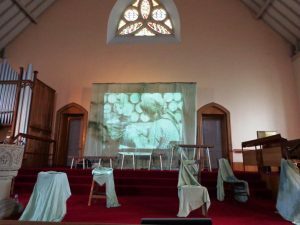 This was touring a play called get up and Tie Your Fingers written by Ann Coburn which told the story of the Eyemouth Disaster from the perspective of the women left behind. The choral score to it was written by Karen Wimhurst. Here we are performing one of the songs. From this, I formed SeaSang Productions as I realised the power of involving communities in telling their story through multi platform theatre productions. I have also been involved as a singing leader and performer with Electric Voice Theatre Scottish Superwomen of Science 2018 tour.